With Mock Rock, one of Biola’s most exciting student events right around the corner, I decided to share a little bit about the event with you guys from the point of view of someone who’s on a team, ME! If you’ve been to a tour here at Biola then you probably know what Mock Rock is, and what it’s all about. If you haven’t been on a tour at Biola and you have no idea what Mock Rock is, then that’s why I’m here! 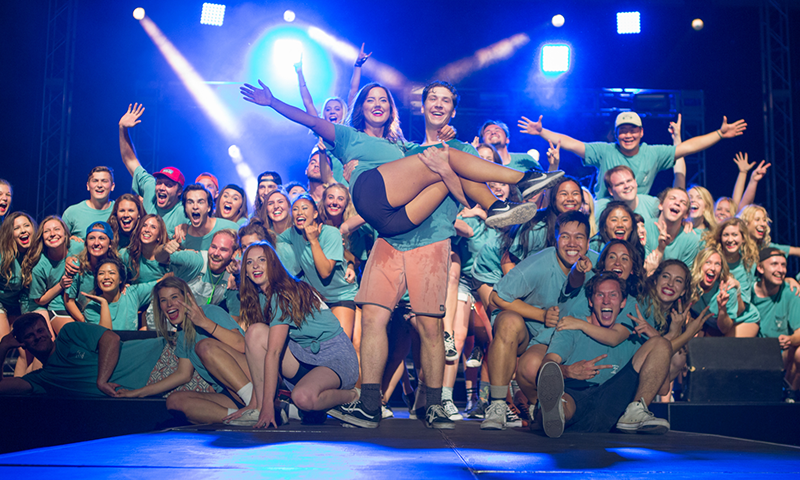 Mock Rock is Biola’s huge, annual, lip-syncing competition. The different teams that compete in the competition are put together by students and all the dancing and singing you see on stage is choreographed by students. If you’re interested in making a team you can always go to the Mock Rock mixer that they have sometime during second semester. The only hard thing is that if you’re trying to start a whole new team you’re going to have to find a lot of people that will be committed to putting in work and getting your choreography down. The easiest thing to do is just join one of the pre-existing Mock Rock teams. You can find out more about these teams if you go to the Mock Rock mixer. After going to Mock Rock my freshman year, I was sad I didn’t decide to participate in it so I told myself that I was going to do it during my sophomore year. This year, I went to the mixer and talked to some people and I eventually got onto a team. I had no idea what to expect because I have never done any choreographed dancing or anything with Mock Rock in general, but now that we are so close to the actual show I am glad I did it. At the beginning, we would only practice twice a week from 9:15 until 11:30, but as it started getting closer, the practices got longer and we started practicing more than just two days a week. Right now, we are about to start our “hell week” which is the week leading up to the actual show which is this Friday. We are going to be practicing every day this week from 8:30 at night until probably 3:30 in the morning. I know many of you are probably thinking about how ridiculous that sounds but it is necessary. The only thing I wish I would have done differently is starting my homework earlier in the week so I wouldn’t be stuck with a whole bunch of homework and literally zero time to do it. In my opinion, the best part about Mock Rock is probably all the people that you get to meet and all the time you get to spend with them laughing, dancing, and losing a lot of sleep! I have met so many great people from participating in Mock Rock that I probably wouldn’t have met any other way. The hangs that you get to experience from practicing dancing in the wee hours of the night are hangs that can’t be beat. If you are thinking about joining a Mock Rock team I say you should do it, if you’re on edge about it, maybe just watch it the first year and see if you really want to do it the following year. However, if you do end up joining a team, make sure that you are ready to devote a lot of time to practicing for one big night of dancing and lip-syncing. Homework almost seems like it becomes less important when you do Mock Rock, so just remember that your grades will still be there after Mock Rock is over. Spend some time making a schedule and figure out times when you can do homework and get stuff done! Mock Rock is a great time, but you don’t want it to be the sole reason you start getting bad grades. Lance is a sophomore journalism and integrated media major from Ventura, California. He is a man of many talents including: photography, guitar, surfing, skateboarding and solving a Rubik's cube in under two minutes. What can’t he do, you ask? Well, for starters, he can’t go anywhere without his toothbrush or keep his composure during emotional YouTube videos. We can’t blame him though.